Do you want to be used for special purposes, or just for common use? 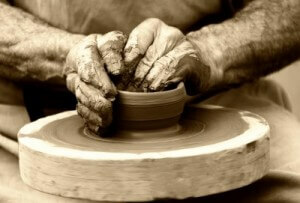 God is the Master Potter and we are the work of His hands. His intention for each one of us is to be used for special purposes, to be vessels of honor. He has gifted us and given us talents with this in mind. Not one of us is meant to be the “chamber pot”! Instead we are to be the beautiful vase, or the chalice of a king. Unfortunately we don’t listen, or we listen and don’t obey, or we think we can’t hold water, or are too dirty to hold the kings wine. Sometimes we don’t like the process that it takes to become that vessel of honor. Clay has to go through quite the process to become anything. It is dug out of the ground, uprooted from its comfort zone. Then it is kneaded to get all the air bubble out. Next, it is thrown on the wheel, not carefully placed, thrown. 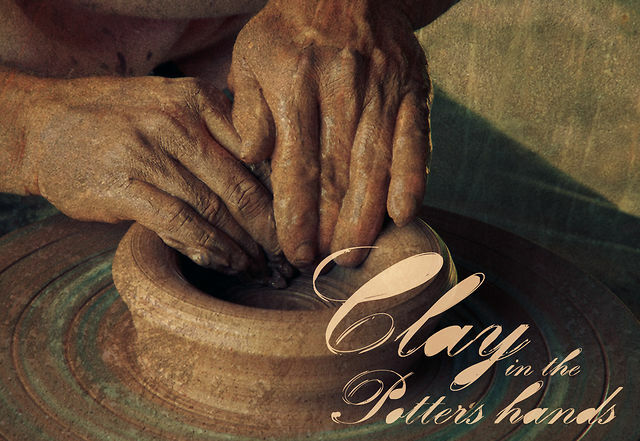 The potter uses his hands and different sharp implements to shape and cut the blob of clay into the shape he wants. Most of the work is done on the inside, invasive, in the beginning and the outer work is finished up last. After all of that work, the final stage is the fire. Only through trials and through trouble can we become solid and usable. So maybe we got off track and we became flawed. Don’t fret; we are still in the Potter’s hands. This is the safest place to be! Allow Him to remake us. It isn’t always easy. In pottery class I learned a lot. Any piece can be broken down and crushed into dust. Then it is soaked in water until it is soft and pliable, only then can it be remade. If you have allowed your heart to be hardened, it will take longer and may be more painful. But always, God can start new with us. 1. They name the name of Jesus. 2. They abstain from wickedness. 3. They are prepared for every good work. 4. They flee youthful lusts. 5. They pursue righteousness, faith, peace, and love. 7. They are not quarrelsome. 8. They are kind to all. 9. They are able to teach. 10. They are patient when wronged, gently correcting those in opposition, with the intent of helping them come to their senses and escape the snare of the devil. So what will it be? Will you surrender your heart to God, The Master Potter, and allow Him to make you into something beautiful? Matthew 5:48 “You, therefore, must be perfect, as your heavenly Father is perfect [that is, grow into complete maturity of godliness in mind and character, having reached the proper height of virtue and integrity]. God see’s the end from the beginning. He can see the finish line, the finished product. He sees His children as perfect. As the Master Potter-He designed you just the way He wanted you. The whole time with the picture in His mind of what you will be when you are complete and mature. But there is work to be done. Molding. Shaping. Kneading. Glazing. Firing. All to get us to the finished, expected end, a vessel of honor. The Master Potter never makes all of His vessels the same. He isn’t a mass-market-producer. He hand crafts each one individually. Some of us may have similar gifts and talents, similar calls on our lives, but we each have a special, individual personality that God uses in a unique way for his purpose. We can’t judge ourselves by what we see in others. We can’t think we are worse (or better) than anyone else. The Master Potter made you the way He saw fit. God looks at me and sees the finished design. To Him, I have already made it through the fire, without cracking or breaking, with no flaws or blemishes, perfectly formed and beautiful. I may see my flaws, my mistakes and struggles. Or maybe I didn’t let the Potter finish the job, jumping out of the fire, trying to fashion myself in the image of what I want to be, or worse yet, how others see me. I have to place myself, willingly, in His hands, asking Him, “What do you want me to do,” and “Who do you want me to be.” Sometimes we have to start all from scratch and ask Him, “How do you see me,” and if we aren’t even close, ask Him to start over and re-make us again. It’s like looking at a blueprint before the foundation is even laid. I am being perfected, through trials, test and just plain living. As I stand on His word and build a relationship with Him, connect with other believers and join a church family, I am growing and maturing. Those rough edges are being smoothed over just like river rocks. I am being perfected by being patient and persevering. One pastor recently put it this way, “Persistence destroys resistance.” Refusing to back down or give up. I can’t grow weary in well doing. I press towards the mark. I run (or walk, sometimes plod) towards the finish line. Like Paul, I will win the prize! God’s strength keeps me going. His joy sustains me. His promises give me hope. There is Light at the end of the tunnel. I haven’t arrived yet-but I am on my way! Jesus, I thank you for your shed blood. When I needed redemption, you were the Sacrifice in my place. Jesus, I thank you for your love. When I was unloved and lonely, you were the Lover of my soul. You were the bridegroom and your Father chose me as your bride. Jesus, I thank you for your strength. Captain of the host of heaven, and you rescued me. Jesus, I thank you for your Word. When I was lost and living in darkness, you were the Light that brightened my day and enlightened my future. Jesus, I thank you for your peace. When I was tossed on every wave, you stilled the storm and calmed my heart. Jesus, I thank you for your forgiveness. When I stumbled and fell, you picked me up, and were a friend that sticks closer than a brother. Jesus, I thank you for your gentleness. When I came to you broken and bent, you were the Master Potter who remade me into a vessel of honor.